Stocks rallied on Friday after two positive pieces of news for the market. At 8:30 a.m., the Labor Department said the U.S. economy added 312,000 jobs in December. That blew past an expectation of 176,000 jobs. Later on Friday morning, Federal Reserve Chairman Jerome Powell said the central bank will be patient in raising rates, quelling fears of tighter monetary policy in the near future. The Dow Jones Industrial Average closed 746.94 points higher at 23,433.16, or 3.3 percent, and briefly rose more than 800 points. The S&P 500 rallied 3.4 percent to 2,531.94, with the tech sector gaining more than 4 percent. The Nasdaq Composite climbed 4.26 percent to 6,738.86. This was a rebound from Thursday’s plunge, which was triggered by a massive drop in Apple’s stock. Boeing led the Dow higher after the jobs reported lessened fears that the economy was slowing down. Shares of the plane maker surged 5.2 percent. Gains in tech-related names also boosted the broader market. Netflix and Intel rose 9.7 percent and 6.1 percent, respectively. Netflix rose after Goldman Sachs added the streaming service to its conviction buy list. Analyst Heath Terry called Netflix “one of the best risk/reward propositions in the Internet sector. 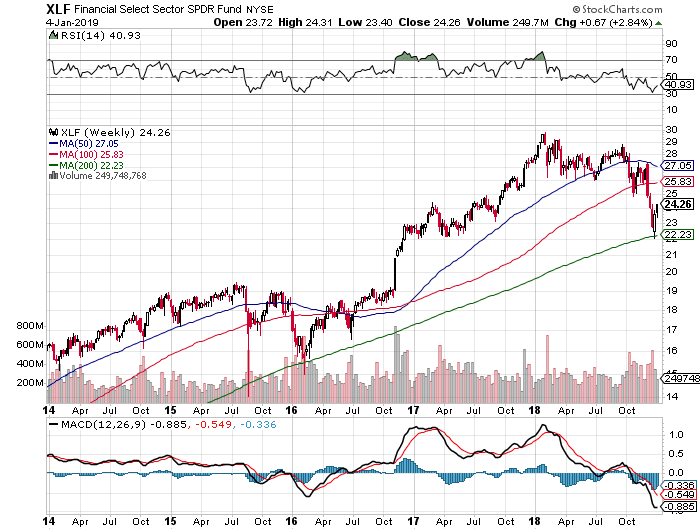 ” Dow-member Intel rose after Bank of America Merrill Lynch upgraded it to buy from neutral. The gains in Netflix and Intel also lifted other tech-related stocks. Facebook, Amazon, Apple and Google-parent Alphabet all rose more than 4 percent. 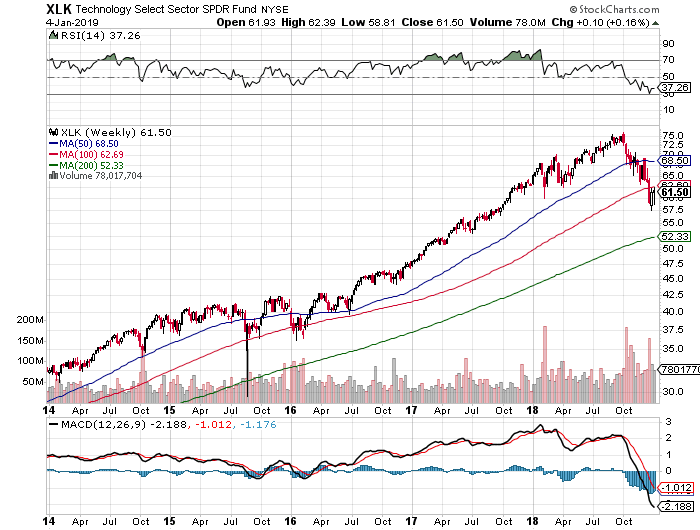 The Technology Select Sector SPDR fund, which tracks the S&P 500 tech sector, gained 4.4 percent. Before I begin my Outlook 2019, I'd like to take the time to wish everyone here a Happy & Healthy New Year to you and your loved ones. I'm recovering from a minor flu but feel a bit better today and think it's time to post some of my market thoughts and my Outlook 2019. In order to proceed smoothly, I will use the services of Mr. X. He's not someone you know, not a high-profile Wall Street strategist, he's a figment of my imagination, my inner voice who is there to ask questions so I can structure this comment. Mr X: I noticed you didn't go over a wrap-up of 2018 this year, why is that and what are the lessons you draw from last year? To be brutally honest, I didn't feel like going over 2018, I was looking forward to putting last year behind us and saying good riddance to it. 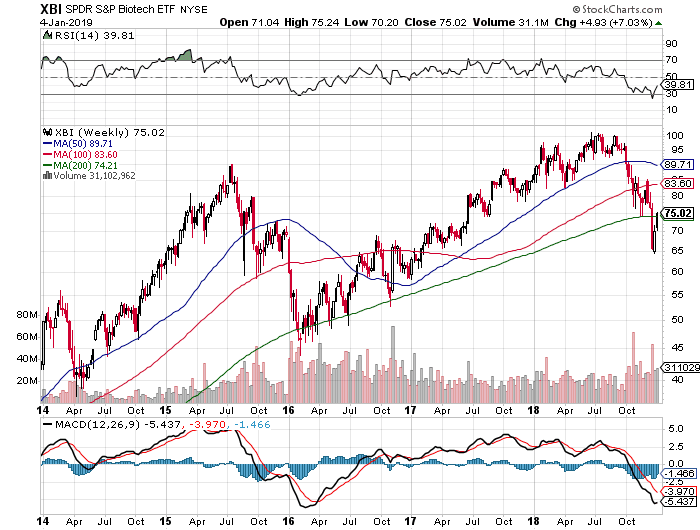 I would refer people to some charts Pension Partners' Charlie Bilello posted on their site here as he did an excellent job going over the year. But if I were to go over 2018, I'd tell people to begin with my Outlook 2018: Return to Stability. Last year, my friend, François Trahan who was inducted to the All-America Research Team Hall of Fame in 2016, was kind enough to share his wise insights with my readers. I highly suggest everyone goes back to read last year's outlook carefully as it laid a lot of the groundwork for my macro thoughts last year and many of my market comments. For example, in July 2018, I wrote a comment on why it was time to get defensive, explaining once again why we need to pay very close attention to the yield curve and ignore those who tell you otherwise. I also explained why till then tech stocks ( (XLK)) kept surging higher as part of a Risk Off defensive trade but going forward it was best to focus on stable sectors like healthcare ( (XLV)), utilities ( (XLU)), consumer staples ( (XLP)), REITs ( (IYR)) and telecoms ( (IYZ)) that got hit early last year as long bond yields rose and investors got all nervous about the bond teddy bear market. As shown below, defensive sectors like healthcare ( (XLV)) and utilities ( (XLU)) outperformed all other sectors last year (click on image below, h/t Visual Capitalist). 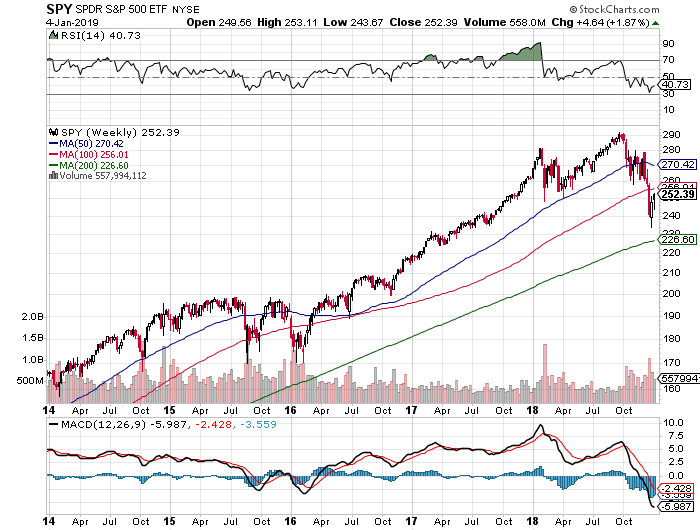 The other important point I would draw from last year, and this is my opinion, is that there was a lot of concern about trade wars where I believe the Trump Administration had some valid and legitimate concerns, but in the end, it was Fed Chair Jerome Powell who broke markets with his overly hawkish stance and this is what led to a disastrous Q4. On the pension side, I note that all asset classes except for the US dollar got clobbered last year and what that tells me is most US pensions will report weak returns but the strength of the greenback will help them (click on image below, h/t Visual Capitalist). Similarly, in Canada, large pensions that don't hedge currency risk will have some relief as the strength of the US dollar will add to their overall returns but don't expect them to have a great year unless private markets really kicked in and more than made up for big losses across public markets. Also, I would say large pensions like HOOPP and OTPP who allocate a lot more to fixed income probably did a lot better than others. In a recent interview, OTPP's president and CEO, Ron Mock, said they were very concerned about tariffs and stated that Teachers' started bringing its equity allocation down "very substantially" from mid 40% to 33% "not as a view but as need to take volatility out of the portfolio as we felt we are going into a volatile period." Just that tactical asset allocation move (even if that wasn't their view) helped Teachers' weather the storm in Q4 but admittedly, it lost some of the upside going into Q4, right before the worst October since 2008and the bad Santa selloff of 2018. I think HOOPP's high allocation to fixed income (close to 50%) helped a lot but it doesn't have as much exposure to private markets as Teachers' and other large Canadian pensions and it fully hedges its F/X risk and in a year where the Canadian dollar lost ground to the US and other major currencies, that move will cost it performance. But one valuable lesson of 2018 which HOOPP understands well is the value of a good pension. There are healthy debates on the dirty secret behind Canada's pensions but I truly believe that we are entering a new era where more and more people all over the world are going to want the government to step in to bolster retirement policy so everyone has access to a well-governed defined-benefit plan they can count on. In fact, I recently had a phone call with James Pierlot and Catherine Marsh of Blue Pier, Canada's first and only fully outsourced, customizable and scalable pension solution, and stated flat out: "It's time we treat retirement policy and pensions the same way we treat healthcare." They both agreed and also agreed with me that while enhancing the CPP is a great idea, it's simply not enough, more needs to be done so all Canadians can retire in dignity and security (I'm sure some will disagree with us). Mr X: Leaving pensions aside because most people reading this comment don't have a pension and couldn't care less about pensions they don't have access to, what are some other important market observations you can make from last year? As you can see, similar to early 2016 when we had a global growth scare, S&P low vol stocks significantly outperformed high beta stocks, especially during the fourth quarter when the year fell apart after the Fed got overly hawkish and failed to properly communicate its flexibility in monetary policy going forward (again, this is my opinion). I mention this for two reasons. 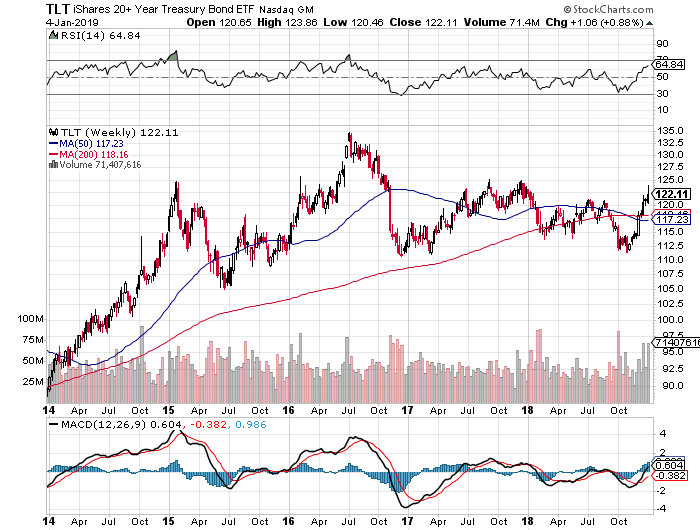 First, stop listening to people on television even if they have the title of the "bond king" or if their name is Warren Buffett telling you bonds are a bad investment. Buffett got killed on many of his stock picks last year and while Gundlach beat his rivals to remain the bond king, he did it by being heavily overweight mortgages. 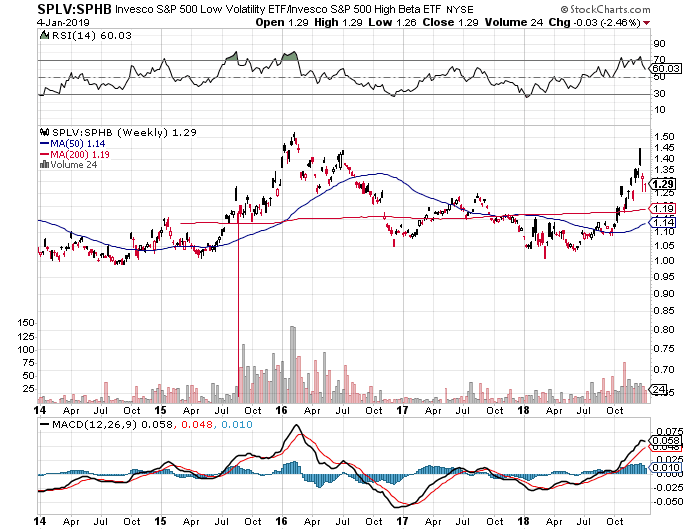 In fact, an astute blog reader of mine told me the iShares MBS ETF ( (MBB)) slightly outperformed Gundlach last year (not on a risk-adjusted basis) but it looks as if he "practices what he preaches because he was underweight Treasurys and duration." 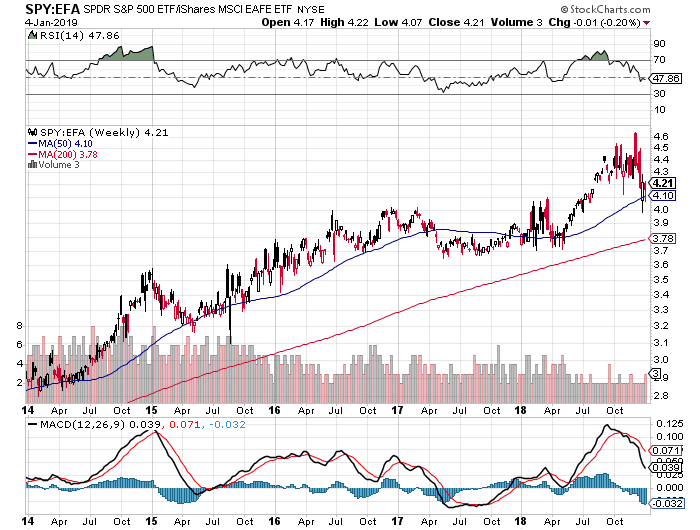 Anyway, my point in all this is if you had 50% of your money in the S&P Low Volatility ETF ( (SPLV)) and 50% in US long bonds ( (TLT)), just as I recommended to PSP's new CEO Neil Cunningham last February when he took over power at that organization, you wouldn't have had a spectacular year but you definitely would have preserved your capital and ridden out a terrible fourth quarter. 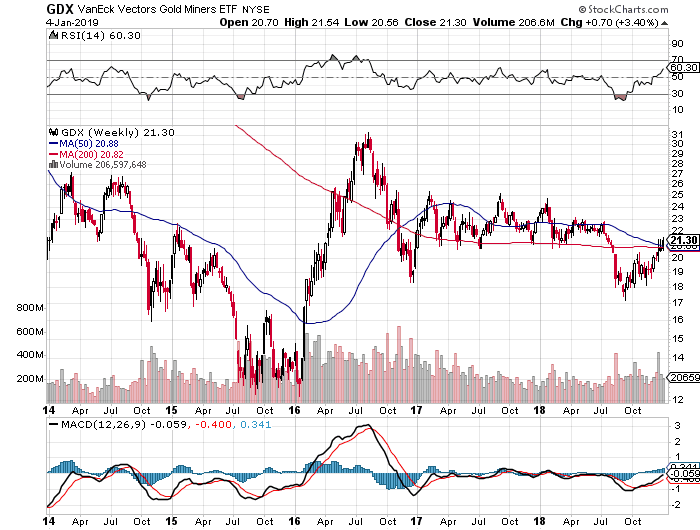 Must admit, I'm not a gold bug but some very smart people (like Ray Dalio) think you need a 5% allocation to gold to properly diversify your portfolio and if there was ever a time to do it, I guess now's the time (I'm still not convinced but paying close attention to gold and gold shares). Mr. X: Alright, so the big themes last year were the flattening of the yield curve, tariffs, the Fed, the return of volatility leading to the outperformance of low volatility stocks over high beta stocks and a flight to safety (US long bonds). Can you discuss what you are worried about going forward and what you're looking at? Sure, going into today, Friday, January 4, 2019, I was increasingly worried about the real possibility that 2019 will be the year of a global synchronized downturn. I'm still concerned about it but not as much. Mr. X: Please explain why not? Was it this morning's strong US jobs report? No, it had nothing to do with the strong US non-farm payroll numbers. Employment is a coincident indicator and inflation is a lagging indicator so I don't pay too much attention to those reports or the fact that wage inflation seems to be perking up. However, the stock market, credit spreads and the ISM New Orders Index are part of the leading economic indicators and that's what concerns me and should concern the Fed. What changed today was the tone of Fed Chair Powell and that somewhat reassured me that he understands his gross blunder and is going to be a lot more careful in how he communicates Fed policy going forward. He also stated the Fed ‘wouldn’t hesitate’ to tweak balance sheet reduction if it was causing problems and this too was an important point which also reassured me because as Francis Scotland of Brandywine Global rightly noted in mid December, forget about the policy rate, it's the balance sheet that matters. Mr. X: I thought you were openly critical of Fed Chair Powell and even said President Trump should fire him. Now you seem to agree with him. Please explain. I was very critical of Fed Chair Powell after the December meeting, called him the Fed Grinch who stole Christmas, and openly wondered whether Trump was going to fire him as the bad Santa selloff unfolded. In fact, I thought he should and openly disagreed with those who stated Trump cannot fire him (legally) or that it would wreak havoc on markets, especially if he was replaced with a more dovish Fed Chair who understands markets and the threat of global deflation, someone like Neel Kashkari who I think gets it. But Powell's tone changed today and I think the market slapped some sense into him after the last Fed meeting and now he gets it. I think he got scared and realized he made a huge mistake and backtracked or at least was a lot more humble and careful in his statements today. Mr. X: Got you, now please share some of your thoughts on what this means for markets going forward and what are the main risks you see going forward. Well, the reason I called my Outlook 2019 "When Doves Cry?" is because going into the new year, I firmly believed the Fed is done raising rates and depending on how bad things got, we would see a possible rate cut and a stop to the reduction of the balance sheet. Today, we saw a more dovish side to Powell and if that persists, it means the Fed is effectively out of the picture for the remainder of the year. It's too early to make such forecasts but this is where I think we're headed. Also, we need to look at the world today, economic weakness persists in China, Japan, Europe and elsewhere, we have not conquered global deflation in any meaningful sense, the Fed needs to be very careful here in establishing its monetary policy. Financial media are focusing on the Fed honcho comments and the US jobs report news (released despite shutdown). But futures were already up overnight on this news, plus word that US and China will meet to hammer out trade agreement. QE, trade, & jobs is a pretty powerful mix. There might be a double bottom forming on the 200-week and if shares keep surging higher, it will be positive for global growth. Janet Yellen was the one who impressed me the most today because she kept referring to how important it is to pay attention to what's going on outside the United States where a lot of countries are hurting because of the rise in the US dollar last year and the commensurate rise in dollar-denominated debt. Mr. X: Speaking of the US dollar, you correctly predicted it will rise last year. What are your thoughts going forward? This is important because the rise of the US dollar exacerbated dollar-denominated debt and imported global deflation because the rising dollar lowers import prices. There is no imminent selloff in the greenback because relative to the rest of the world, the US is still in far better economic shape. 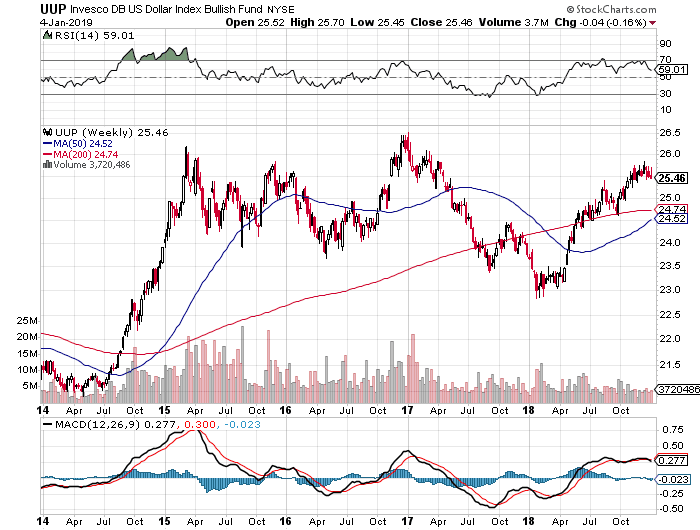 Still, if the US economy slows and the Fed leaves rates unchanged or even cuts rates if the economy slows a lot in the second half of the year, you will see a decline in the US dollar throughout 2019. Mr. X: What about impeachment? What happens if Trump is impeached? I know a lot of people who despise him would love this but if Trump is impeached, and I'm not placing high odds on this outcome, the US dollar will tank, stocks will tank and yields will rise depending on who comes into power (the initial flight to safety will send yields plunging lower) . Mr. X: Alright, what about global growth? Will the rest of the world grow if the Fed stays put? That's a tough one. The ECB and other central banks followed the Fed in tightening their monetary policy. It becomes a relative game at this point which is why I'm looking closely at which central banks cut aggressively in 2019 and what stock markets around the world are telling me. Mr. X: So you prefer non-US stocks in 2019? You see going into the fourth quarter of 2018, US stocks handily outperformed global ones but then they got whacked hard in Q4 and it's hard to argue global stocks will continue to outperform in 2019 like they did in Q4. 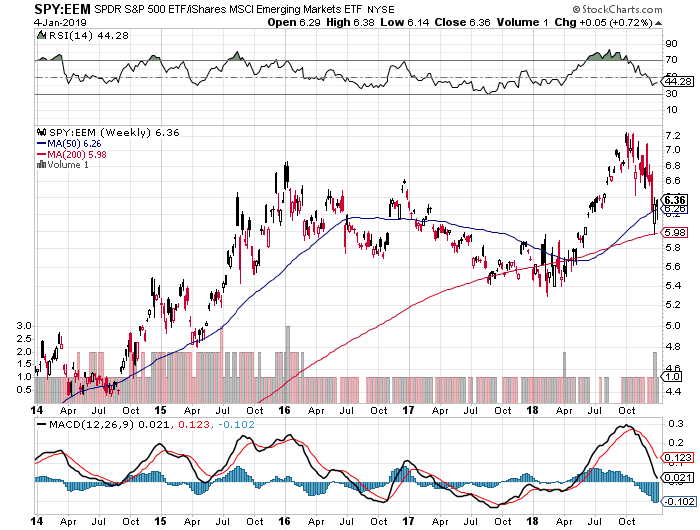 My bias remains US stocks only because US stock markets are liquid, transparent and are the best markets in the world with amazing companies but if you think global growth is coming back, you can invest in emerging markets or play commodity indexes like the Canadian S&P/TSX. 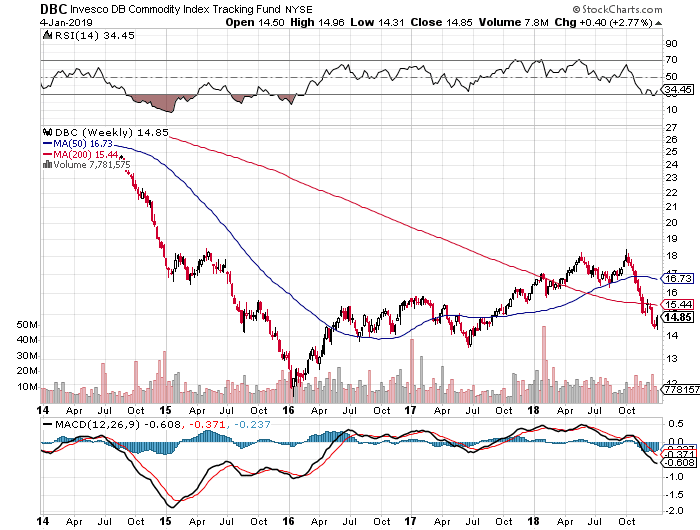 Mr. X: So you're bullish on oil, commodities and commodity currencies? 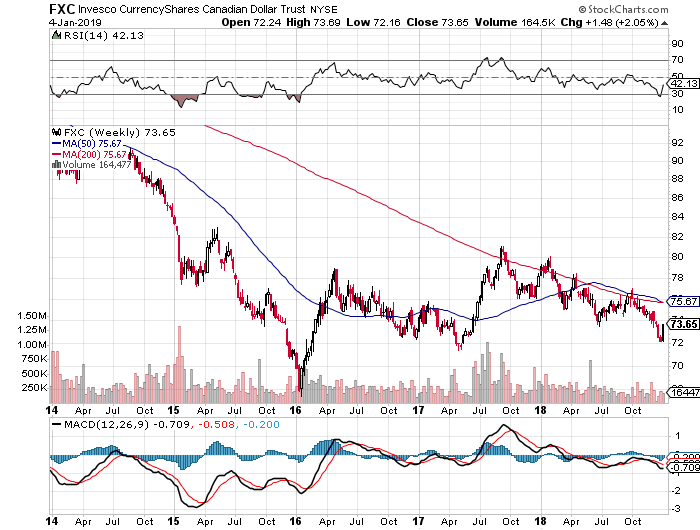 I'm bullish in the short-term because oil got destroyed in the fourth quarter of 2018 and that didn't help the loonie but longer-term, I need to see a pickup in global growth before I can be bullish on commodities and commodity currencies. Mr. X: Thank you, so you don't have any strong macro convictions going forward? No, like I stated above, going into this year, I was very concerned of a global synchronized downturn. I'm still concerned but a lot less now that the Fed and other central banks are turning dovish. It really depends on what is going to happen and how the Fed will navigate a very challenging global environment. Mr. X: Last year, you recommended stability and stable sectors. Is this where you think investors should focus on this year? Again, going into the year, I was really worried the Fed bungled it up and we would see a global synchronized downturn. I'm still worried it's too late but after today, I'm trying to see if the Fed can engineer a soft landing. Also, given the massive dislocations in Q4, there will be huge tradable rallies in various sectors going on all year as we try to figure out whether the world will escape a global recession. Go back to read my last comment on making stocks great again. It was a bit easy to predict a large relief rally was coming at the end of December and that it will carry over into January but nothing is guaranteed and as we saw Thursday when Apple warned, markets are very shaky and some sectors are a lot more shaky than others. I told my followers on StockTwits and LinkedIn if Apple shares hold above their 200-week moving average, they will eventually recover but there are important technical levels that need to be cleared first. 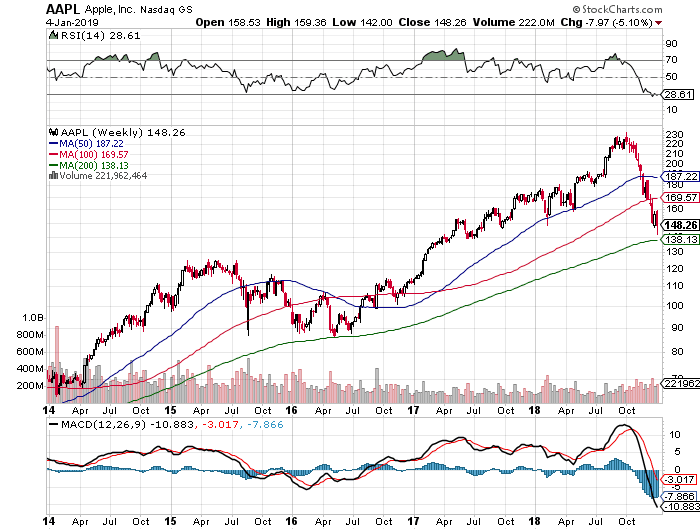 Conversely, if they fall below the 200-week moving average, it could be a long bear market for Apple's investors. The broader technology ( (XLK)) index is doing better but it's still struggling here and needs to move above its 100-week moving average and sustain gains to resume an uptrend. 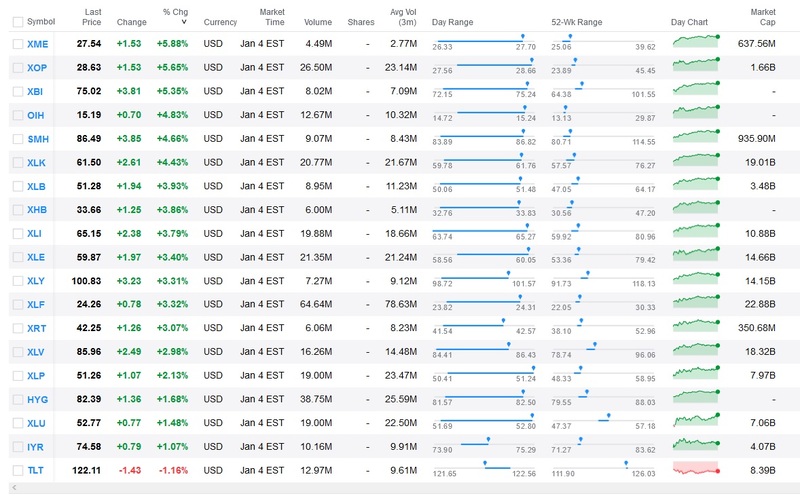 As you can see, Metal & Mining ( (XME)), Oil & Gas Exploration ( (XOP)), and Biotech ( (XBI)) were all top performers, gaining over 5% and Staples ( (XLP)), Utilities ( (XLU)) and REITs ( (IYR)) were the worst performers but still managed to gain on Friday. In other words, on Friday, the biggest gainers were sectors that benefit the most from lower interest rates and those that are leveraged to the global economy. All these sectors got clobbered in Q4, so not surprised to see them rally today. So, if I were to sum it up, I'd expect the bounce to continue in the first quarter and will benefit many sectors that got hurt the most in Q4. I'd also expect S&P High Beta stocks ( (SPHB)) to outperform S&P Low Volatility ( (SPLV)) during Q1 as RISK ON macro trades dominate RISK OFF ones, but make no mistake, it will be very choppy and unless everything falls into place on the economic and political front, volatility will persist (but maybe shorting vol will also be a great Q1 trade). Mr. X: Which sectors are you watching closely here and why? Financials lead the economic data and if banks are selling off or sink into a bear market, that doesn't portend well for the overall economy. 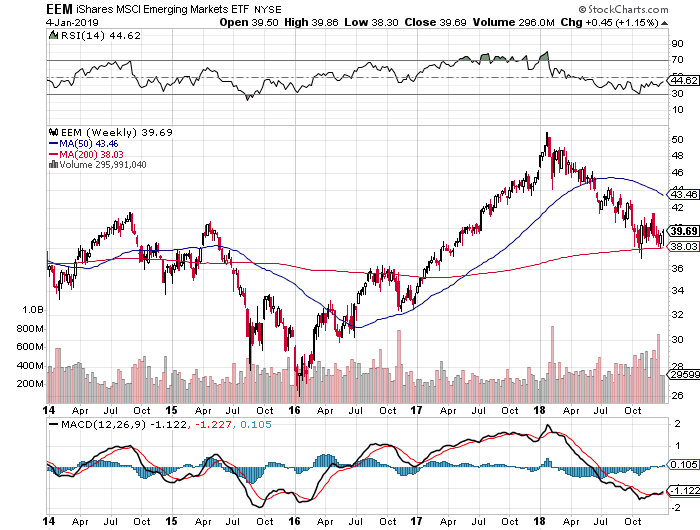 Outside the US, I remain fixated on emerging markets, as I stated above. So far, they remain weak but are not sinking lower and that's good news. 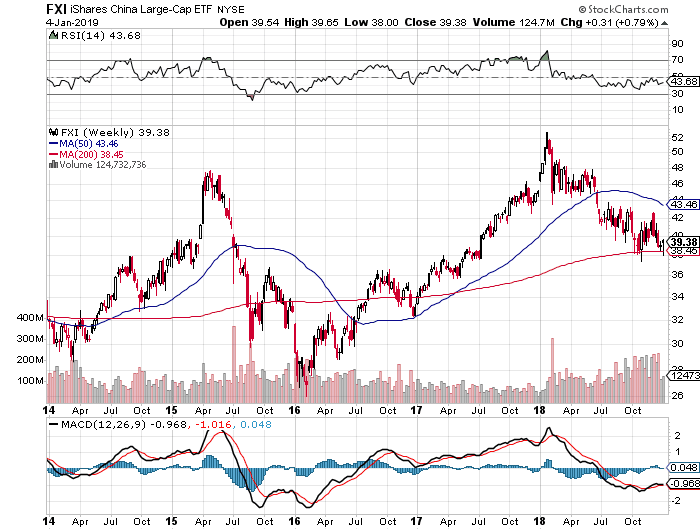 As far as other sectors, I think there will be more Apple-like negative surprises in technology and other sectors where the China factor looms large but it will be interesting to see if the market shakes off the bad news. Mr. X: Do you still like healthcare? The problem with biotech is it's very volatile but when it turns the corner, it rallies like crazy and some individual biotech shares will really rally like crazy in Q1. There are other sectors in healthcare which I like here, including generic drug makers that got decimated in Q4. I guess I'd be careful with large pharmaceuticals like Merck ( (MRK)) and Pfizer ( (PFE)) that were top performers in 2018 as everyone looked for safer healthcare stocks. They still look great but I'd be taking some profits here especially if RISK ON trades come back in vogue in Q1. 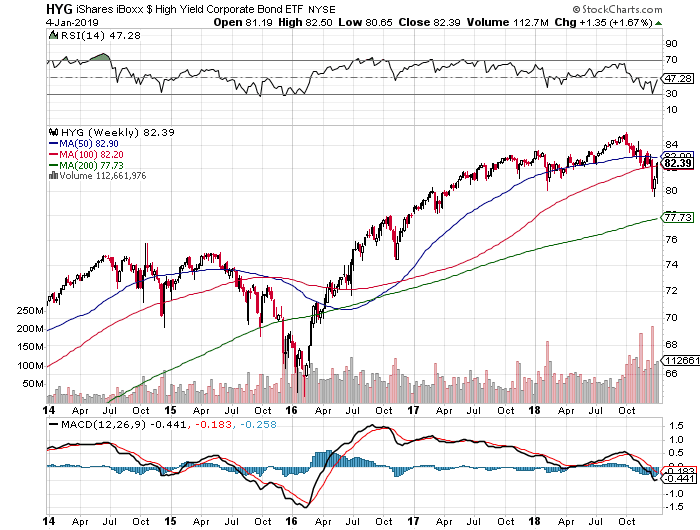 Mr. X: What about credit markets? Mr. X: I think you covered a lot, you must be tired, are there any parting thoughts? I am tired but needed to start the new year with my outlook and structure my thoughts. We live in a very uncertain world, things are constantly changing and evolving and it's important to look at the big picture when investing.